Tyson Fury aims to defy all the odds when he lock horns with WBC heavyweight champion Deontay Wilder. Fancy Tyson Fury to win the fight? 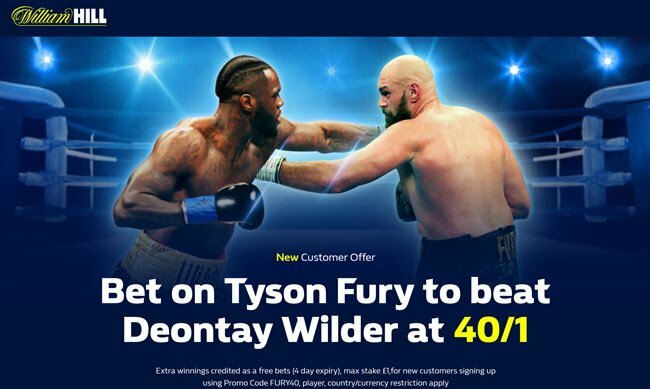 William Hill are offering a massive 40/1 price boost on Fury to beat Wilder! Unmissable offer! Fury has not faced a proper test since producing the best performance of his career to beat Wladimir Klitschko in Germany in 2015, but he has heavily backed by punters and his odds are continuosly shortening. The Gipsy King is currently backable at 5/4 at maximum, but you can get a terrific 40/1 when you join William Hill through this page. Extra winnings credited as a free bets (4 day expiry), max stake £1,for new customers signing up using Promo Code FURY40, player, country/currency restriction apply. Furthermore, William Hill are offering the perfect incentive to sign up with them and enjoy your betting on every sport, every market, every day! g) which is settled without using Cash in my Bet (i.e. you do not qualify for this promotion if you cash in your bet prior to the completion of the fixtures), (a “Qualifying Bet”). "Get 40/1 Tyson Fury to beat Deontay Wilder at William Hill! Promo code: FURY40"